These days whilst travelling, if you are of English, Australian, or American origin, it’s highly likely you’ll cross paths with another fellow from your home country with which you can exchange memories of home, share observations of whatever culture you’re currently immersed in or comfort each other during a rough trot on the road. But every now and then you come across another traveller, from a much farther away land than your own, who teaches you a little something about your home land. Said person is a young Polish hitchhiker picked up on Hwy 1 in Northern California by the group of four I was travelling with. Of a likeminded eco warrior ilk (like who isn’t in California) Wojtek (pronounced Voy-tek) told us about a brilliant home-made (or is that made-home) house built in Wales by one man, his father-in-law and a bunch of enthusiastic volunteer eco-home enthusiasts. If you’ve ever wanted to live in a something that looks something like a cross between the Papa Smurfs house and the hobbits home in the Lord of the Rings, then these are the people to get in touch with. Simon Dale is the man behind this fantastical low impact woodland home. 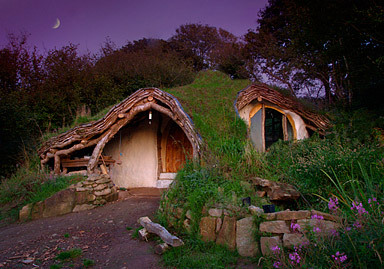 Dug into the hillside for low visual impact and shelter this enchanting home is quite the eco design to commend. What makes this home so eco? Stone and mud are used for retaining the walls and foundations; spare oak wood from the surrounding woodland is used as the frame; straw bales in the floor, walls and roof offer ‘super-insulation’; lime plaster on walls is breathable and low energy to manufacture (compared to cement); reclaimed wood is used for floors and fittings; a wood burner for heating (the local wood used as fuel is renewable and plentiful); solar panels produce enough energy for lighting, music and the computer; the water arrives by gravity (marvellous invention, that one!) from a nearby spring; and a compost toilet… and that’s just the beginning. Why would you want to build your own eco home? “Building from natural materials does away with producers profits and the cocktail of carcinogenic poisons that fill most modern buildings”, says Simon. It took an estimated 1500 man hours and £3000 to build, which is about as cheap as it comes in terms of sustainable eco housing… any housing come to think of it. On his website Simon tells you exactly what you need (“chainsaw, hammer and a one inch chisel, little else really”) to build your own low impact home. He also invites you along to gain some practical experience by working on a project similar to the one pictured here, before giving it a go yourself. Simon reassures saying you don’t have to be a carpenter or a builder (he wasn’t) to learn how to build this kind of structure. Sometimes it takes a Polish man in a foreign country to tell you about the magical green places in your own backyard. It’s wonderful to think there are now so many environmentally conscious initiatives and projects happening within the one country, that it’s difficult to keep up with them all. Article written by Nicki Ferguson while travelling in California. January 2010.